When British buccaneers took Bengal to their control under the bullets of East India Company , its inhabitants competed so much with each other to show them their loyalty that the said buccaneers became Royals to their docile subjects. The bragging buccaneers termed the land under their occupation as ‘Royal Bengal’ to match their so-called “royalty ” and in the process the Mahabal Bagha (literally meaning ‘a tiger of immense strength’) became “Royal Bengal Tiger”and Mahodadhi (literally meaning ‘unfathomable mass of water, i.e.sea’) became Bay of Bengal. But, to us in Orissa, the sea at Puri is yet the Mahodadhi, the so-called Royal Bengal Tiger is yet the Mahabal Bagha. Such a Mahabal Bagha has jumped out of the 18 feet high enclosure in the night of May 31, a month after it had entered into the Nandan Kanan zoological Park from the adjoining Chandaka forest. While jumping, it has possibly injured its paw, Pieces of its broken nails found on the spot suggest that the great cat has been injured in act of extricating itself from the iron wire mesh used to fortify the enclosure. 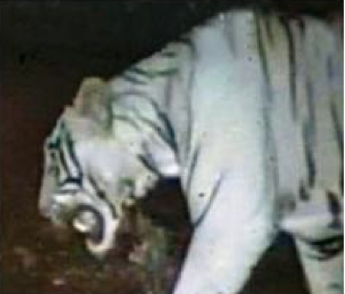 Up till now the tiger has succeeded in escaping the searching eyes of zoo and forest officials; but its body print marked near a nearby pond suggests that it certainly is not able to speed away. Perhaps the injury while jumping over the 18 ft enclosure has caused him some severe damage. In such situations, specifically with broken nails in the paw(s), unable to run after wild animals, tigers become man-eaters. Oblivious of this possibility, an official top-brass has said and the mindless media have carried his version, that the tiger seems to be very gentle in nature! This is nonsense. The official either does not know how dangerous to human being a wounded tiger is; or reflects truthfully the syndrome of nonchalance the State administration is afflicted with. We must not take the risk. The forest officials should be pressed to cage it at any cost sans any delay or to kill it. With broken nails and injuries not yet ascertained, there is every reason to apprehend that the tiger may soon metamorphose into a man-eater. And a man-eater Mahabal Bagha would be a menace that the State should never cherish. I am in total and complete agreement with the assessment. But there is also another story making the rounds: That the animal has died as the zoo keepers could not take appropriate care of this wild and untamed animal. The story further says that it is concealed from the media for fear of criticism from the public and animal protection groups. Matter of very serious concern.